As some of you know, at Pushkin House we have a pavilion at the moment by architect and artist Alexander Brodsky named 101st Km - Further Everywhere. It has been a real joy working with him. The day in early October when we set out in Bloomsbury Square Gardens where the pavilion should stand, we had a couple of hours to kill in the afternoon, before the screw piles arrived. 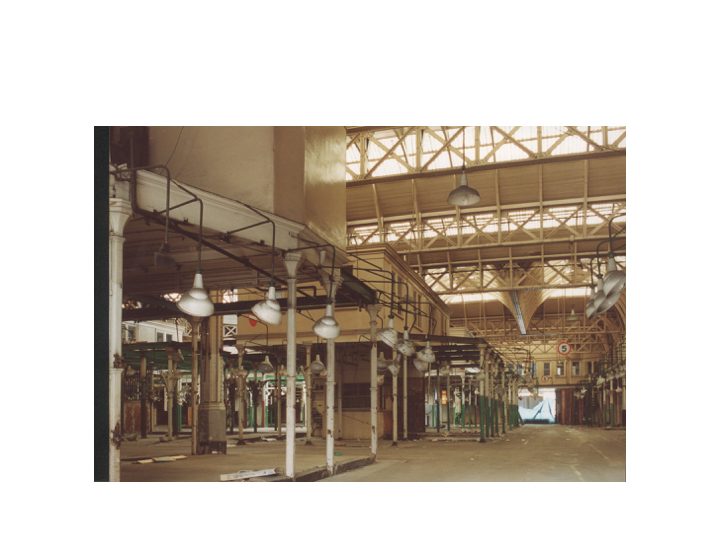 I took the chance to show Sasha Smithfield Market, and low and behold we found a version of his pavilion there. Sasha likes old buildings. To say he likes the patina of time would be crass. It is the medium in which he works. Walking around Smithfield Market with Sasha reminded me that looking at a building with someone else is an active creative endeavour. 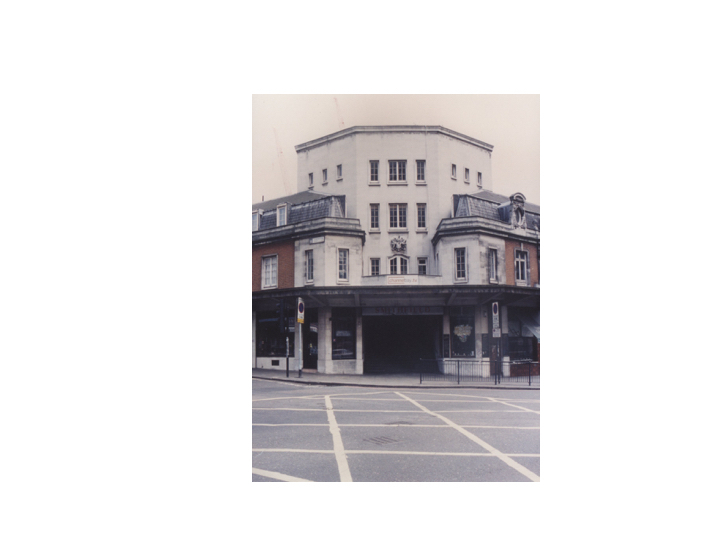 I spent the years between 2012 and 2015 when I was campaigning at SAVE to save Smithfield General Market, looking at this building with fellow campaigners or journalists or property developers we were trying to convince to not demolish it or to conserve it; I hadn’t looked at it with an artist before. We went on to the General Market and Fish Market. Sasha peered through into the dark interior of the General Market and spotted the booths on legs, accessible by metal spiral staircases. 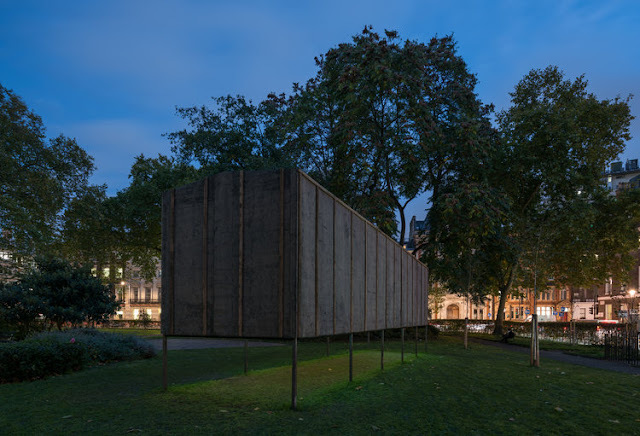 ‘How beautiful’ he said, ‘I hope they will keep them.’ For the first time I saw the romance and beauty of these little booths, possibly because they are versions of the pavilion we have just built on Bloomsbury Square with Brodsky. I saw them as little worlds of their own, rather than disposable which is, I’m afraid, how they are being treated by the architects who have won the commission to convert the building. They will not be a part of the new Museum of London. We walked around to Hart’s Corner - also seen as disposable in the new competition. I remember sitting in the Director of the Museum’s office and making an impassioned plea for Hart’s Corner. It is, I said, a memorial to those that died in the bomb that fell at the end of the war in 1945 killing 70 people and destroying the original corner turret. It is restrained, as a post war repair should be, it is utilitarian rather than flamboyant, unlike the rest of the market. This contrast in itself brings out the decorative beauty of the rest of the building. The whole parade dates between the 1860s and 1960s - let all parts of it sing and tell their story. I did not need to say any of this to Brodsky - he got it - he began to photograph the glass roof-tiles, from below, enjoying their griminess. To him this contrasting patch-up was familiar- he is a child of the Soviet Union after all. I came away with the feeling that the General Market, the building Historic England chose not to list, was the most precious, unusual and beautiful of all of them. Brodksy photographing the glass tiled canopies along the street front of Smithfield General Market, repaired by the City Surveyor following a bomb in 1945 that killed over 100 people. interior of Smithfield General Market from a 2007 presentation by Eric Reynolds, who has been a vocal campaigner for the market for many years. The pavilions on legs and repaired concrete dome (also damaged in 1945 bomb) clearly visible here. General Market interior, showing pavilions on legs. They provided office space while the selling of meat happened on the market floor. Harts Corner, repaired by the City Surveyor after the war, following a 1945 bomb that killed over 100 people. Repaired with restraint, typical of post-war era. With Sasha in the Poultry. steel frame engineered by WRP and Patera for 101st km - Further Everywhere. Pavilion by Alexander Brodsky, curated by Markus Lähteenmäki for Pushkin House, Bloomsbury Square Gardens October 18-Nov 10 2017. Nội thất Quốc Cường là đơn vị chuyên tư vấn, thiết kế và thi công nội thất. Với quy trình làm việc chuyên nghiệp, đem đến cho khách hàng sản phẩm với chất lượng tốt nhất, dịch vụ bảo hành chu đáo, đáp ứng mọi nhu cầu của khách hàng: giá tủ bếp, mẫu tủ bếp, tủ bếp đẹp, tủ bếp, tủ bếp Laminate, tủ bếp gõ Sồi, tủ bếp gỗ óc chó.